Versatile greystone Micro Flannel® heated electric blankets bring the perfect combination of comfort, durability, and style to your bed. You’ll love getting toasty warm with our satin-trimmed light grey Micro Flannel® heated electric blanket. 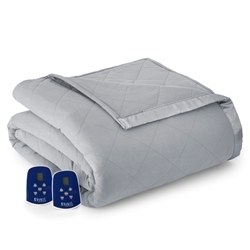 Enjoy the unique, soothing decadence of a heated blanket constructed with our patented 7 Layers of Warmth™, featuring Micro Flannel®, down alternative fill, specially-crafted electrical cloth, and a quilted layer of heating elements. Our luxuriously soft quilted electric blankets are machine washable, bulk-free, lightweight, and breathable.